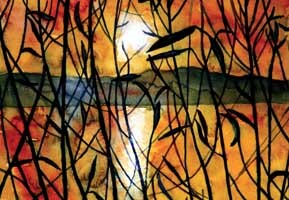 Store > Gifts and Art > Art Cards > Card - "Greenlake Sunset"
These art cards are from paintings created by three local artists. The artists donated these images, and a donor underwrote the cost of printing these cards. So one hundred percent of the purchase price of these cards will directly benefit Pariyatti.